Imiya, a young Aisha, has a huge math test tomorrow... and she can't seem to get her studying out of her dreams! In this game, you attempt to solve the math problems she dreams of, making the Babaas jump over the fence and keeping Imiya asleep at the same time. Watch out for that nasty alarm clock though - you wouldn't want it to go off and wake Imiya up! When you begin a new game, you will be given two options: the type of problems you want to have and the difficulty. For the type of problems you can choose between addition, subtraction, multiplication, division or a combination of all four. Depending of the type of problem you have chosen, you will receive a different amount of points per problem. As for the difficulty, there are three levels - Easy Peasy, Potato Counter and Brain Tree. The difficulty level determines by how much your final score is multiplied when you die. At the end of the game, the score you can see in the bottom right of the game screen is multiplied by the multiplier. This game uses a combination of the keyboard and the mouse. 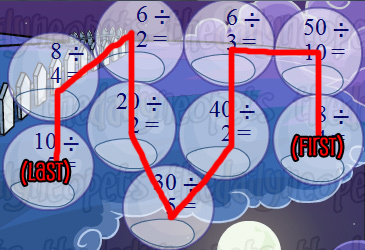 Click on a maths problem with the mouse to "select" it, and then type in the answer with your keyboard. 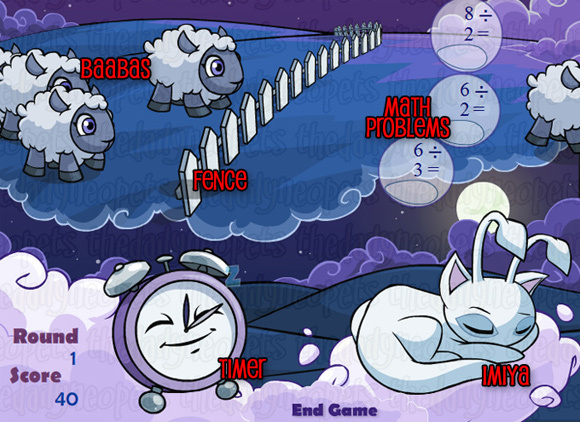 For each math problem that appears, a Babaa will get held up behind the fence. As you answer the questions the Babaas will jump over the fence and continue off the other side of the screen. If you leave a problem too long, its corresponding Babaa will get pushed out by all the ones behind it and it will hit the timer, ending your game! The timer works somewhat strangely in this game: it's "continuous", which means that the amount of time you have left depends on how much you had left at the end of the previous round. The timer resets to full at the end of certain levels: the 3rd, 7th, 12th, and 17th levels. You can also reset it manually once per game with the code letimiyasleep. Play with both hands: one on the mouse and the other on your number keys. This saves time you would have used up switching from keyboard to mouse. It's also slightly quicker if you use the side number pad rather than the numbers above your letter keys, but don't worry too much if you don't have a number pad. With a little bit of extra practice (so you can hit the correct keys without looking at them every time) you will be fine. Use the letimiyasleep code wisely. If you're after a high score (or the avatar), you should be able to get to the level seven time-reset without using it - that way you have it to use later, when you're expected to do more rounds in the same amount of time! Watch your timer and know which round you'll need to use the code on before it begins. That way you can type in all but the last "p" before you start the level and the timer counts down more. One way to score high is to play division on Potato Counter mode. This may seem like it would be harder, but actually, it's easier! The answers are mostly just one digit long, which means that it's a lot quicker to type in answers. By playing this way and using your timer-reset code after Level 7, you should be able to earn a score of about 5,880 or 5,920. If you're looking to earn a trophy, however, you may struggle to succeed by playing on Potato Counter. Since the problems have a delay between appearing, it's nearly impossible to get past Level 17 (no matter what type of problem or difficulty level you're using). To earn a trophy, you can play division on Brain Tree mode. The answers will still typically be fewer digits, but you'll need to practice a lot to learn all of the answers to the problems so you can quickly type them. The Babaa - Maths Nightmare avatar is awarded to everyone who is in the top fifty on the Maths Nightmare high score table when trophies are awarded each day. This is generally easiest around the beginning of the month, as less people have had the chance to send amazingly high scores before you. If you play on the first of the month early in the day, you might even be able to earn the avatar playing on Potato Counter mode. Trophies are awarded around 11:40 PM NST each day. This game can be quite a challenge, and the combination keyboard/mouse controls may take some getting used to, but with practice you'll be on your way to getting a trophy - and the avatar - in no time! The Snowager is awake. He'll be sleeping in 6 hours, 29 minutes.